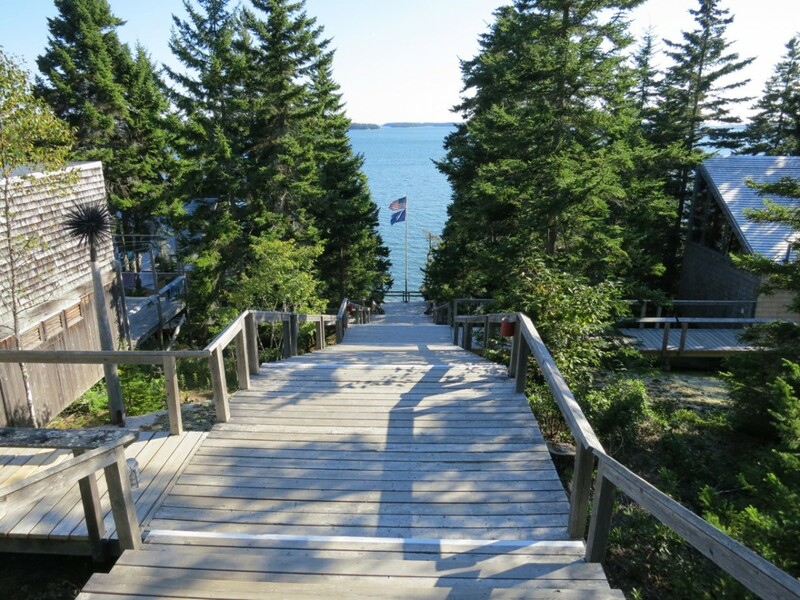 The Schoodic Symposium ended, successfully all around, last Sunday, the 14th. 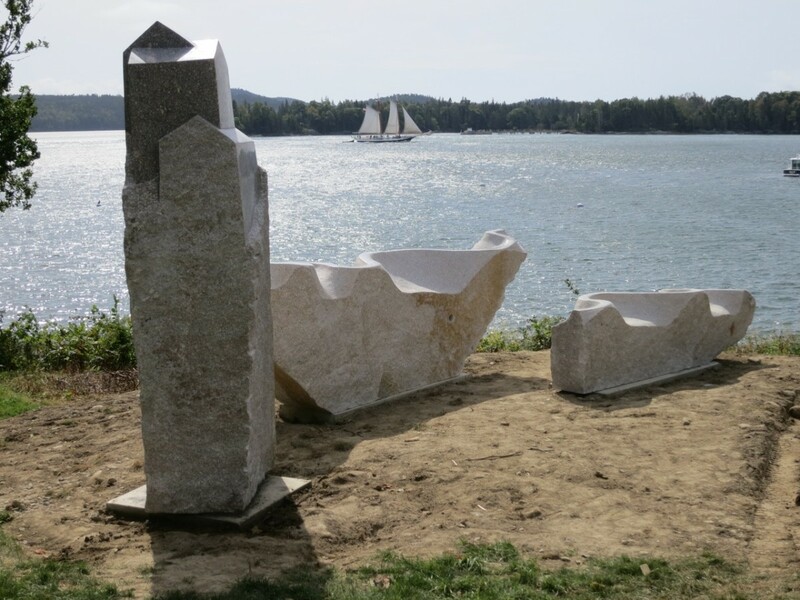 I spent a couple days with my good friend Barbara Haring in Orland just 8 or 10 miles north of Castine, where Home and Away is now installed on its site next to the Wilson Museum. 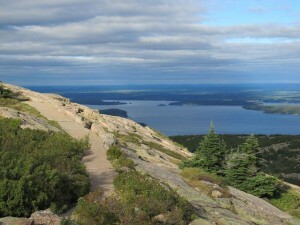 Barbara graciously showed me more of Downeast, including Acadia National Park and Cadillac Mountain (splendid views all round of mountains, islands, granite headlands, small harbor towns, boats, and the sea) Haystack School of Crafts (where we got a short tour from the director). On Tuesday, Barbara took me up to Bangor, to UPS (to ship home my tools and misc.) and then to the airport. 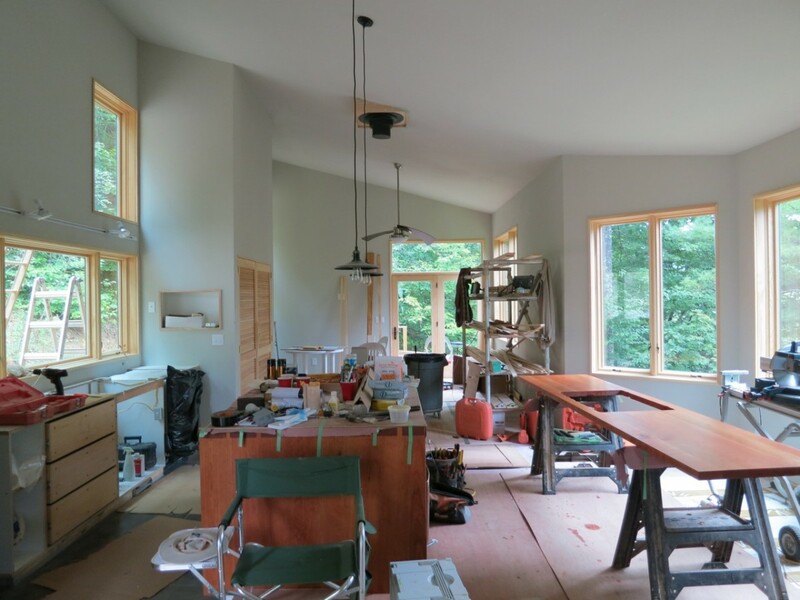 I flew to Asheville, North Carolina to visit Doug and Kathie Sigler at Penland, and to check out the latest house I designed and Doug is building – we call it The Caboose, because it’s near an earlier, larger one we called Coal Train House. 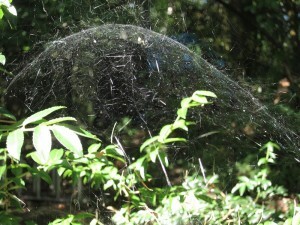 (Heading to the Blue Ridge Mountains? Stay at Coal Train! It’s pretty special, if I do say so myself. www.coaltrainhouse.com). 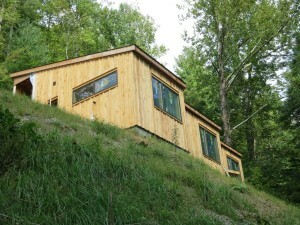 The Caboose looks great – open and airy, with Doug’s characteristic excellence in construction, craft, and detail. 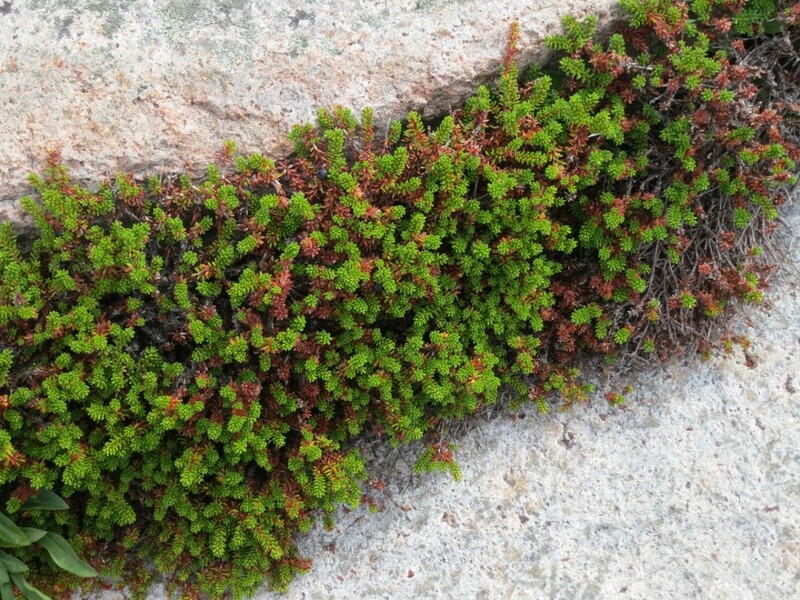 What follows is a brief report on the last weeks of the Symposium. 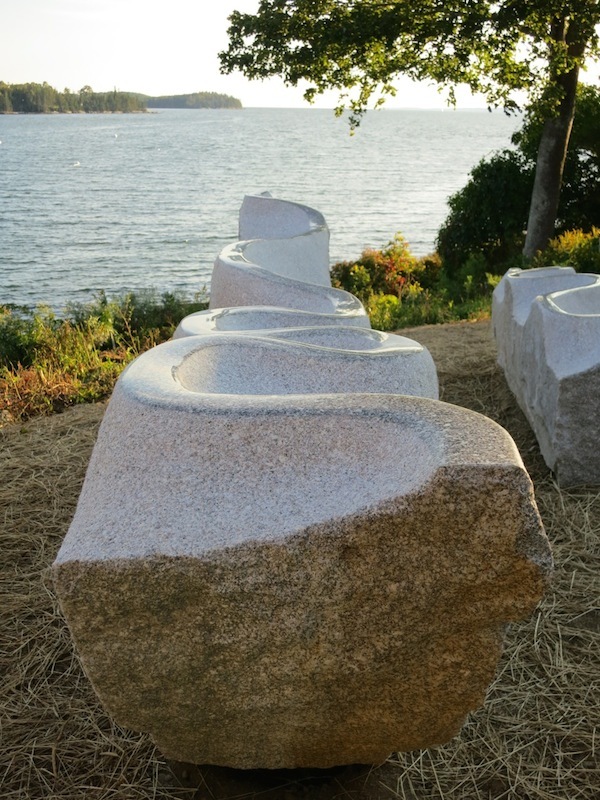 I last wrote just before Labor Day, and by then I had roughed out the forms of the three granite elements comprising Home and Away. I used a 14” Husqvarna saw with a water feed and a specially mounted diamond blade that can cut flush across the broad surfaces of the houses forms, and 7” grinders, as well, with similar water feeds and flush mounted blades. 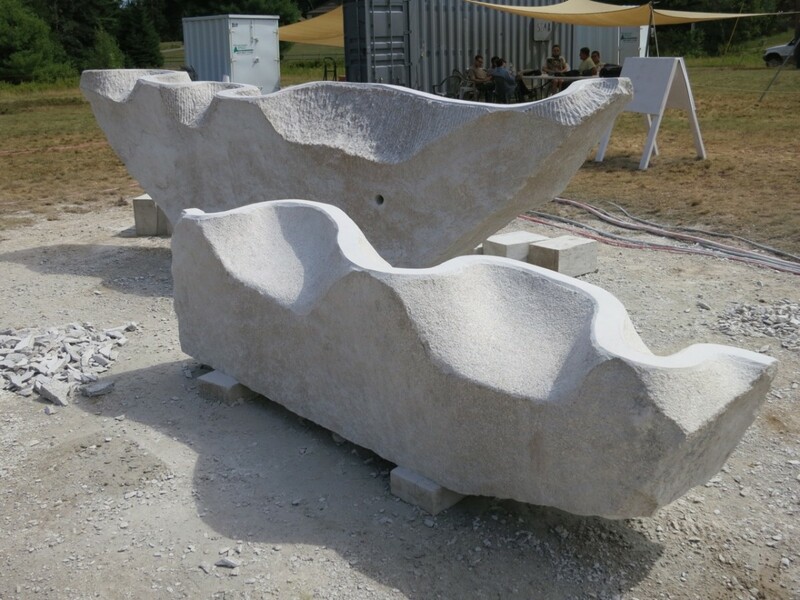 I outlined the meanders with a smaller grinder and roughed out the hollows by making parallel cuts into the stone with diamond blades and then breaking away the granite with a hammer and chisel. That process is sometimes referred to as fret cutting. 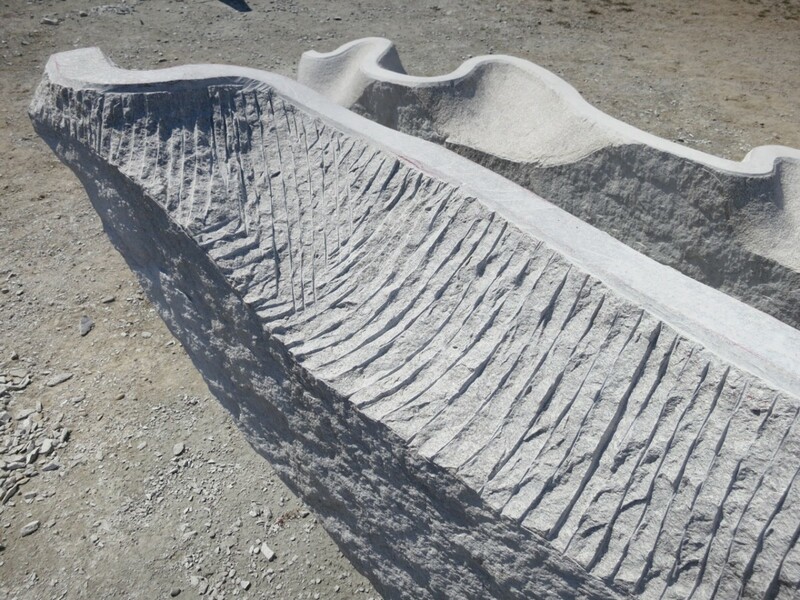 Jesse Salisbury worked with each of us to size the footings for our pieces and he began having them pre-cast toward the end of August. At the work site we used a crane to position the three granite elements as I wanted them in relation to one another. The tall form was the most challenging. Jesse, his dad Jim (who did most all of the crane work), and Mark Herrington (Jesse’s on-site double) helped me strap it up, lift it, and swing it into position. 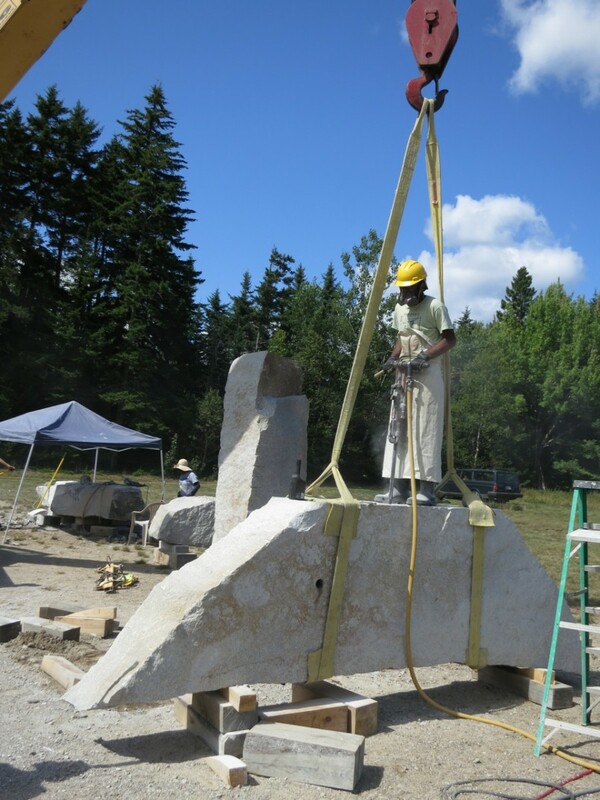 As the 4-ton stone dangled from the crane, we pushed it around to set its final location and angle relative to the other two elements. 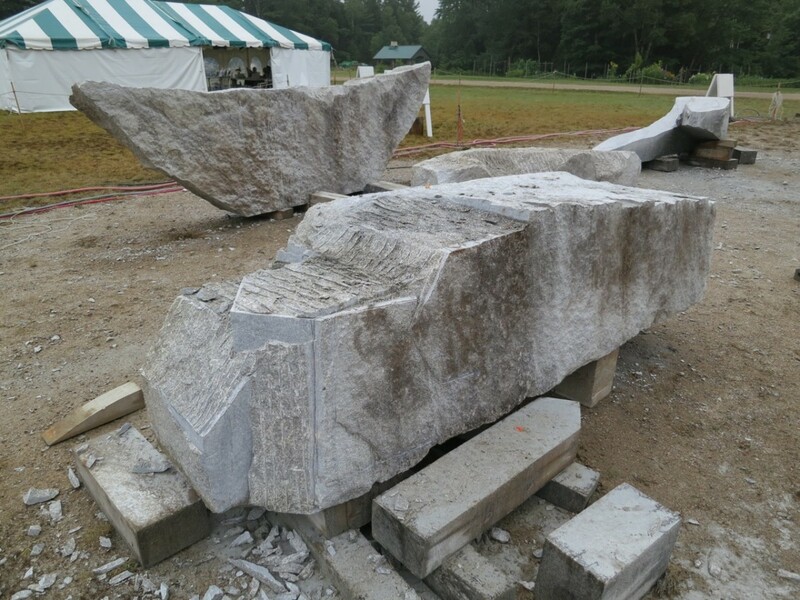 We took meticulous measurements and I made full-sized templates of each piece beforehand to use in positioning the footing blocks next to the Wilson Museum. 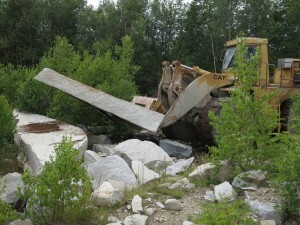 Mark Herrington and I traveled to Castine on the 29th and used the templates to locate where the blocks needed to go so the excavator could dig a hole for them. 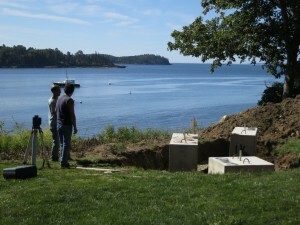 We delivered them on September 4, and worked with the excavator to position and level them. Back at the work site, I worked on refining forms and surfaces. I ground down the faces of the houses and the tops of the meanders using an angle grinder and coarse, medium, and fine diamond cup wheels, (again with water) and then polished with diamond pads and water, the houses to a 500 grit surface, and the meanders up to 1500 grit. At 1500 they have a pretty bright shine, and a nice feel. Much of the stones’ faces was left natural, as it came from the quarry. I bush-hammered the hollows below the meanders with a pneumatic hammer and a nine-point chisel to create textured, gently undulating surfaces. The intermediate surfaces around the house forms were “pointed” by hand, with a pointed carbide chisel and a hammer to create a more broken, rocky surface. Bush hammering took about three days of solid work. Polishing took more like five days. And then there were lots of corrections to make surfaces and curves look and feel right. Touch is very important in the piece, especially the meanders, which I want people to follow with their hands. 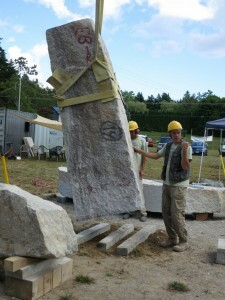 Cleaning up the tall stone was a challenge. It had red and black quarry numbers spray-painted on the curved surface that would face the Museum. We tried a number of strippers and solvents, ending with a tile cleaner containing phosphoric acid. That got most of it, and Mark lightly sandblasted it to clean up and even out the ghosting. My china marker centerlines on the stones also required stripper to remove. Finally I power-washed the stones. The three elements of Home and Away were essentially finished by Monday of the last week (September 8th). The last task was to cut in a shallow flat surface and epoxy the bronze plaque – Jesse had asked U.S. Bells, the small foundry next door, to cast one for each sculpture, identifying the title, artist, date, and the symposium. 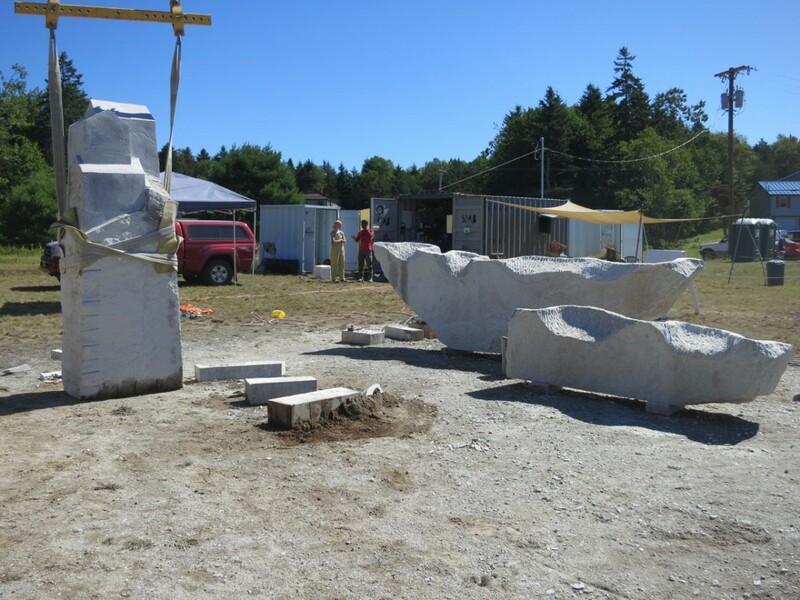 This time around, at least, all of us were finished and our works were set up, ready for the Closing Ceremony on September 10th. Several hundred people attended the final ceremony. Jesse and the organizers spoke, supporters and volunteers were recognized, each artist said a few words, and we each got flowers and a handsome small bronze bell from U.S. Bells. Directly after the ceremony, cranes and trucks pulled in and my piece and two others were loaded up for installation the next day. 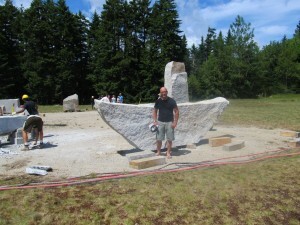 Bright and early on Thursday, the 11th, we headed to Castine, where the three parts of Home and Away were carefully lifted off the truck, centered over the stainless steel pins, turned and positioned as necessary and lowered into place, with a small crowd of locals watching. 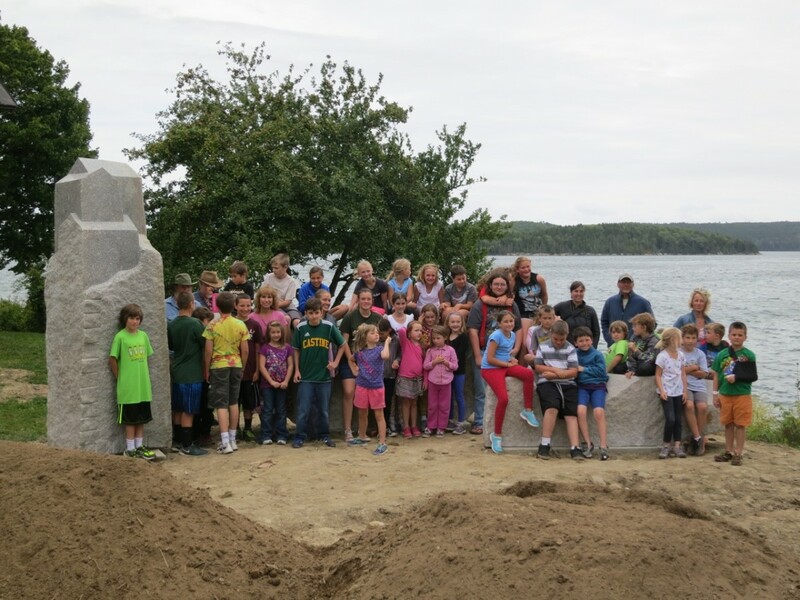 An hour or so later, the kids from Castine School showed up in front of the Museum. I explained how I made the piece, and asked them how many had left a home behind and moved away somewhere else – lots of them raised their hands! Then they rushed off and mobbed the piece, crawling all over it and having a great time. It’s definitely interactive! All the reports are that Home and Away is a success with everybody in Castine. 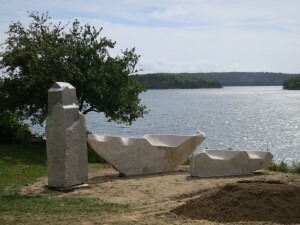 It was very gratifying to see it in place, the forms pointing out to open water to the west. There was a small potluck at the Museum on Monday night (the 15th) for people closely involved, and there’s a plan for a dedication on July 31st next year, which everyone is hoping I can attend. It’s on my calendar! We all worked really hard, and had lots of fun and socializing on and off the field – I did make it to the Claudia Schmitt/Sally Rogers concert (great fun! ), there was a donor luncheon and a dinner to recognize all the volunteers, and Jesse, Mark, and Jim and Donna (Jesse’s parents) introduced us to lots of Downeast culture, including fishing for squid and mackerel at night, clam digging, and a Lobster Boil – a beautiful evening at “camp” on a nearby lake. 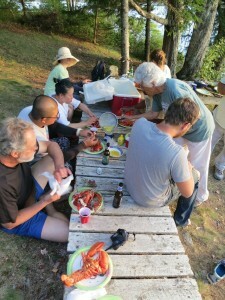 (I ate two lobsters that night!). It’s been an exceptional summer, with great experiences and great people! I am indeed grateful. I got back to Olympia late last night, with lots to do, lots to share, and lots to think about, and intent on keeping my Schoodic spirit alive! 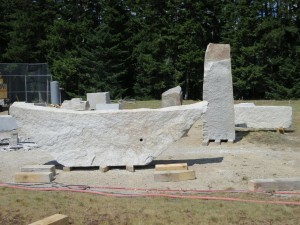 And there’s lots of Cascade granite here to use it on! The last couple weeks have been full ones. There are seven sculptors taking part in the Schoodic Symposium, four Americans, a Georgian, a Swiss, and a Korean, who is here with his wife, also a sculptor. 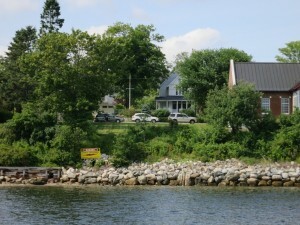 That makes eight, plus two assistants, all staying at an old bed and breakfast in Winter Harbor, about five miles from Prospect Harbor, where the Symposium work site is. We head out between 7 and 8 in the morning, take an hour for lunch (graciously provided on a rotating basis by the seven different communities for whom we are making sculptures), and leave the site at 6. There’s a run on the hot water as everybody gets cleaned up, then dinner at 7, and some talk, and then most everybody heads for bed around 9 or 9:30. I keep intending to compose this second report, but I can’t stay awake! There’s lots of physical work each day. I seem to be adjusting – I’m tired, but not as wiped as I was feeling the first week! 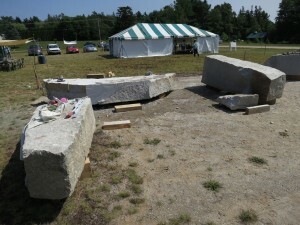 Since I wrote back on the 11th and 12th, I’ve gotten my three stones roughed out. 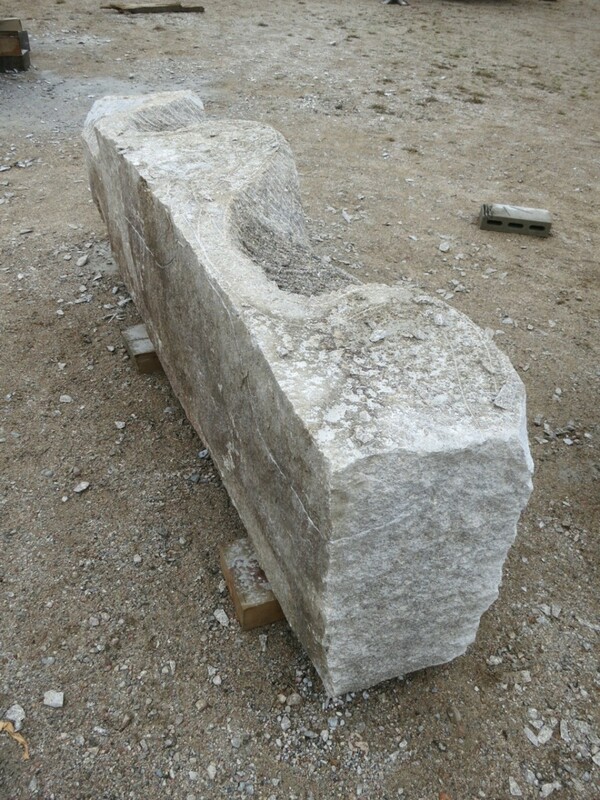 We stood up the tall stone using the crane on site, and I drew the house forms on it, then we laid it back down and I cut them out, starting with an angle grinder with a 7”d. flush mounted blade, slicing into the granite every 1 – 1 ½” or so, and then knocking off the strips with a hammer and a 2” carbide chisel (I call this fret cutting; the Maine sculptors call it scoring). Most of the grinders and saws here are set up with water feeds – cuts down dust and saves wear on the blades, but the grinders don’t last as long. 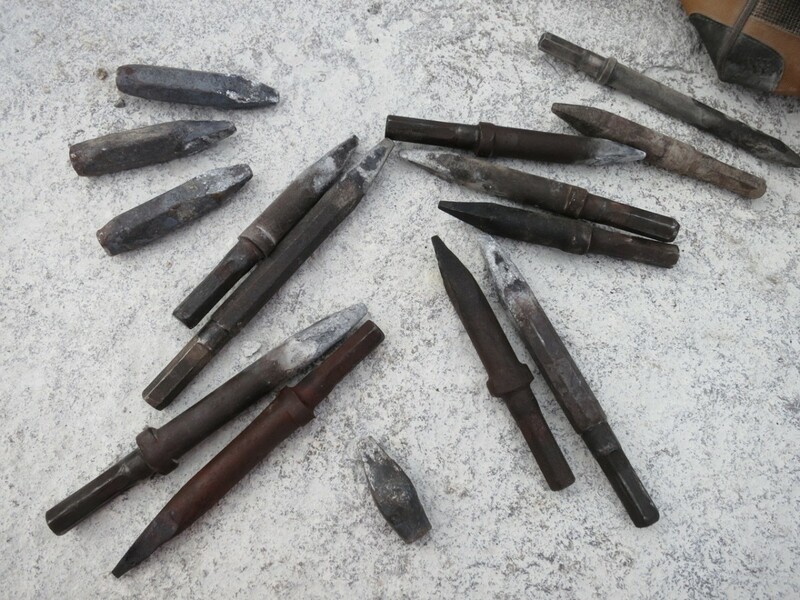 Where there was a lot of granite to remove, I made long saw cuts down the stone, and used steel wedges (forged from pieces of leaf springs) to split off long chunks. 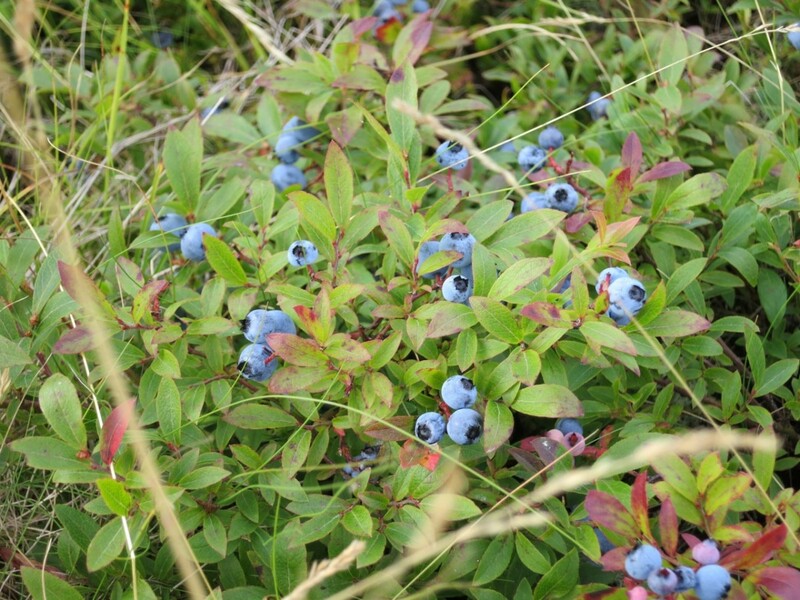 When I got close to the broad flat surfaces I used a Husqvarna electric saw with a water feed. The 14” d. blade is flush mounted to allow one to cut broad surfaces. It’s got a lot of gyrational force and it’s a little tricky to start the cut, but it works pretty well after that. 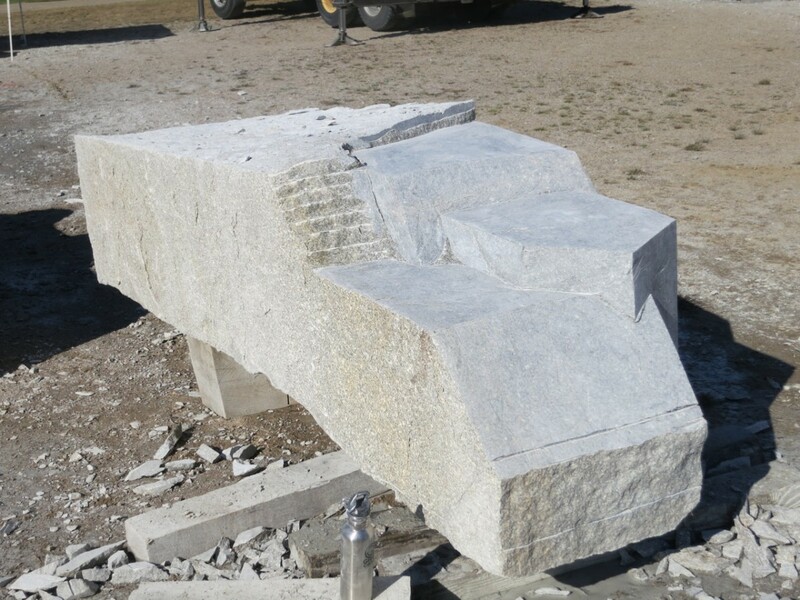 The big saw is easiest to use horizontally, so I did the faces on the top of the stone, and then we used the crane to roll it to the next side in order to cut those faces. 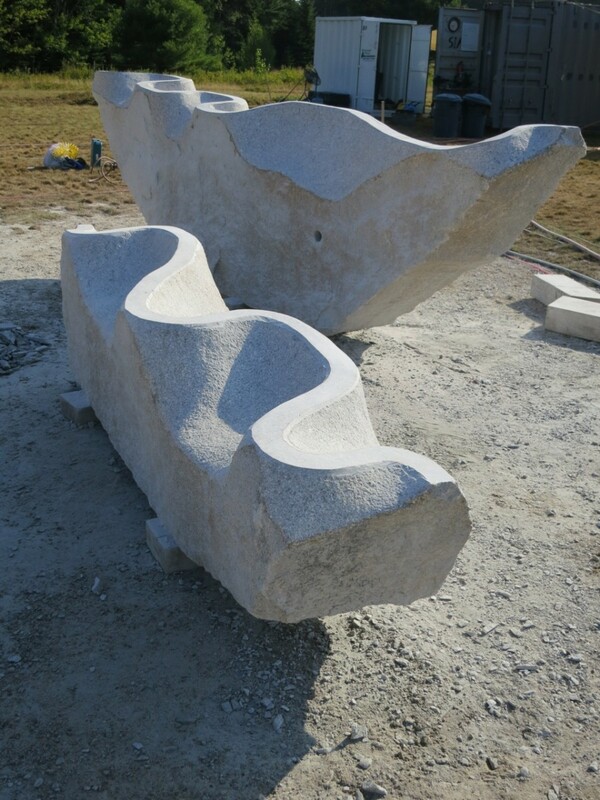 We positioned the two horizontal stones roughly the way they will be relative to each other when installed. I drew the meander forms on the tops, and then on the sides, working with graphite so I could dust it off and make changes, then going over the final lines with orange china markers (they don’t wash off). 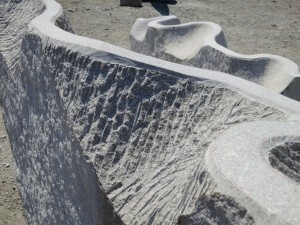 I used a small grinder to trace them out, then the 7” grinder to cut slices into the stone once again to remove material. Back out West, everybody refers to that as fret cutting – they didn’t seem to recognize that name for it here. Fret cutting is slow business, and takes multiple passes to get down close to the final surface. You cut, you hammer, you cut you hammer. And you correct and adjust as you work. I got some assistance with fret cutting and later bush hammering on the lower piece, but most of the big piece I’ve done myself. After getting close to the final surfaces with fret cutting, I switched to an Ingersoll-Rand air hammer with a carbide 9-point bush hammer chisel attachment. 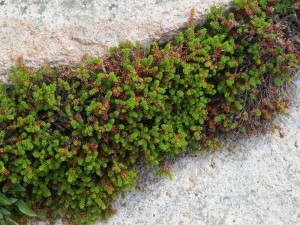 Basically it pulverizes the surface and smoothes it out, giving it a soft and flowing appearance. All this has taken the last two and a half weeks. I just finished three full days of bush hammering today! Now it’s on to grinding and polishing. 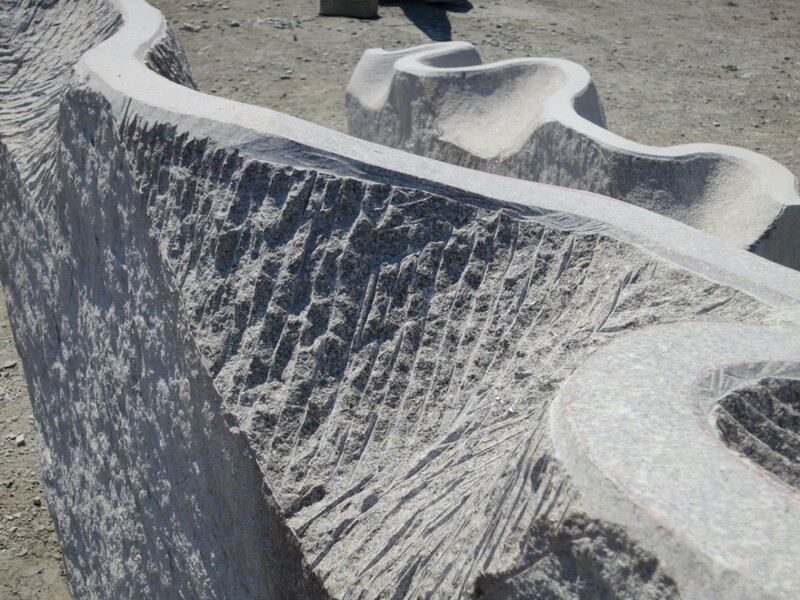 The house forms will have a low polish, and the long meandering paths on the top of the two horizontal stones will have a higher one. I want them to catch the light and also feel good to the touch, so people will incline to run their hands along them. 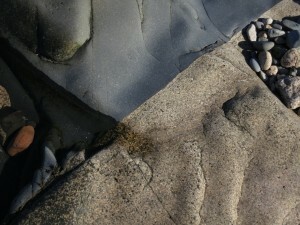 There are other details I may add – perhaps a simple chevron motif on part of one edge of the tall stone. The pattern is from two small Abenaki porcupine quill boxes I saw in the Wilson Museum in Castine. 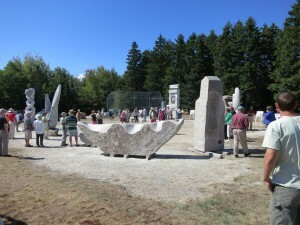 The days on site are full – many people visit, both tourists and locals, and there have been several events for donors, several dinners hosted by local gallery owners and interested folks, a gallery show opening for sculptor Mark Herrington, who’s a senior advisor and assistant to Jesse Salisbury at the Symposium, and shared visits and a lunch with The Stone Foundation, an organization of mostly stone masons and some sculptors that had its own symposium just down the road at the Schoodic Education Center last week. Jesse did a demonstration of splitting using short Japanese wedges one day for them and us. 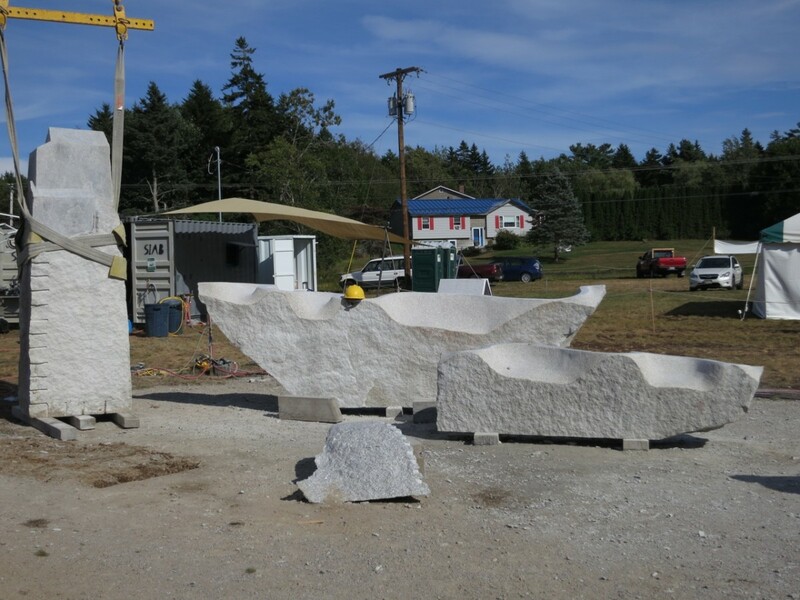 Oh, and also visitors from Sculpture Saint John – a sister symposium happening across the border in New Brunswick, that was inspired by and is patterned after the Schoodic Symposium. 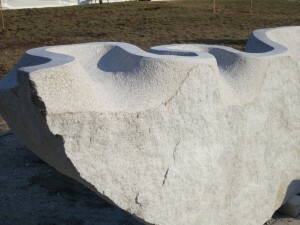 They have eight sculptors at work right now. If there’s time, a few of us may try to go visit them, as well. 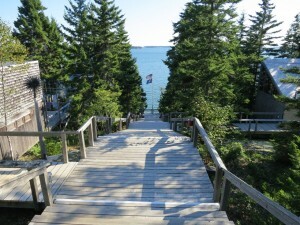 Back at the B&B in Winter Harbor, we get big inventive meals six nights out of seven from two different cooks. Jesse’s dad Jim has lead several evening fishing expeditions for mackerel and squid, which has resulted in a lot more cooking and grilling and eating. Oh, and also, each of the four American artists made 15-minute presentations about his work on Wednesday last week (the 20th) and the Internationals did theirs last night, at Hammond Hall, just down the street. 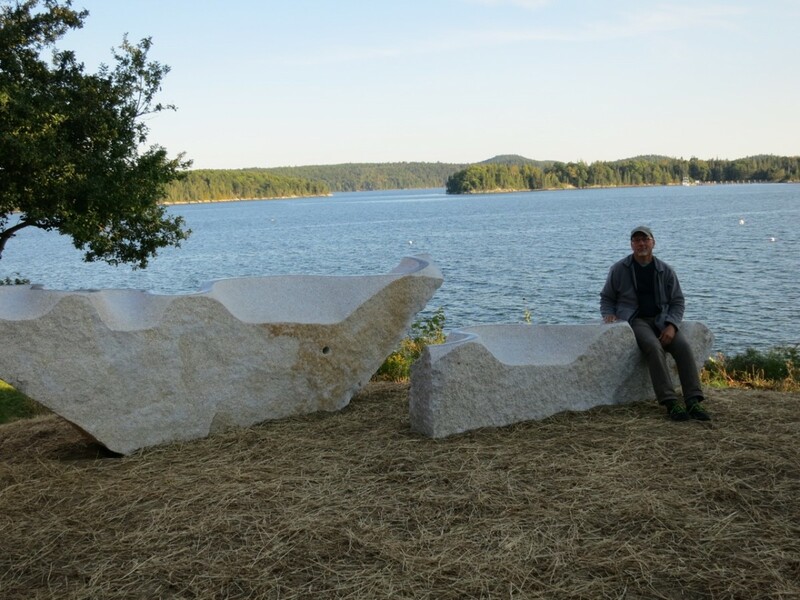 Valerian Jikia, our ebullient Georgian sculptor, has taken a strong interest in available vodkas in the U.S., and in making sure that we drink together as artists. He has us all tossing back a shot (or 2, or 4…) of Absolut or Smirnoff, straight from the freezer, and repeating his Georgian toast to each other, which sounds a lot like “Comma Juice!” I took it upon myself to broaden the investigation by providing a bottle of Maine potato vodka, and another of vodka distilled in Austin, Texas, allegedly from wheat, but more likely from petroleum. The potato seems to be winning out. It’s distinctive and smooth. 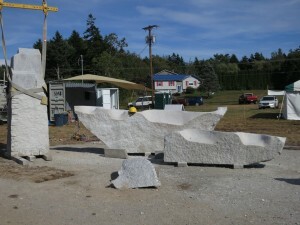 My friend Cyril Reade came back through Maine on his way to Philadelphia a week ago (August 21st), to check out my progress. He brought jam he made and superior Montreal bagels. 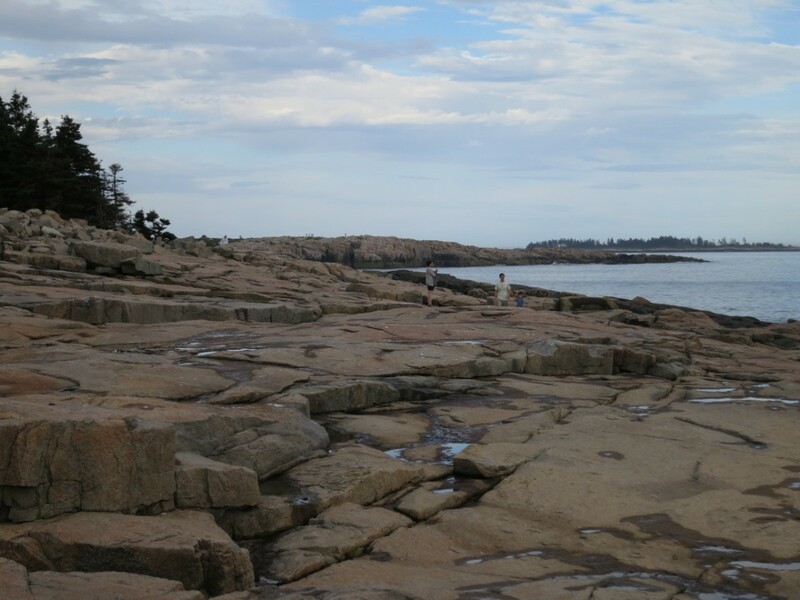 Barbara has trekked over from Orland the past couple weekends and has taken me to a couple of her favorite beaches, one on Mount Desert Isle (excellent cobbles!) and near Ellsworth (expansive views! ), as well as shopping at Remy’s (clothing deals – I’m beating up my socks and t-shirts), coffee, and a classic lobster roll. We also checked out a tidal falls near Sullivan – where some say Down East begins (well, north of there, anyway, thought Barbara says Bucksport marks then southern boundary of Down East). Tomorrow the Castine volunteers man the big reception tent at the Symposium site, so I’ll get to see some folks I probably know from there, and they’ll get to see their sculpture farther along. Local schools are starting, too, so we’ll start to see kids on field trips. It’s Labor Day Weekend, so I imagine there will be lots of visitors. Claudia Schmitt is playing a coffee house concert at Hammond Hall (where we made our presentations) down the street tomorrow night – a voice from the past – mine anyway. Valerie and I used to hear her in Eau Claire when we lived there many years ago. Maybe I’ll go! We’ll work on Saturday, as usual, and clean up and rest on Sunday, then back to it on Monday. Somewhere in there, I’ve gotta get some planning and preparation done for the start of my program at Evergreen in another four weeks! The trick will be to bring some of this Symposium energy to my class this fall and keep it going! Good thoughts to all of you! 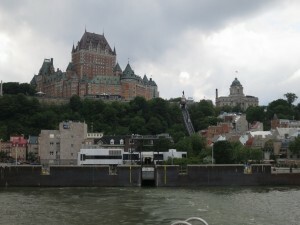 July 20: I took the red-eye via Newark to Quebec City. 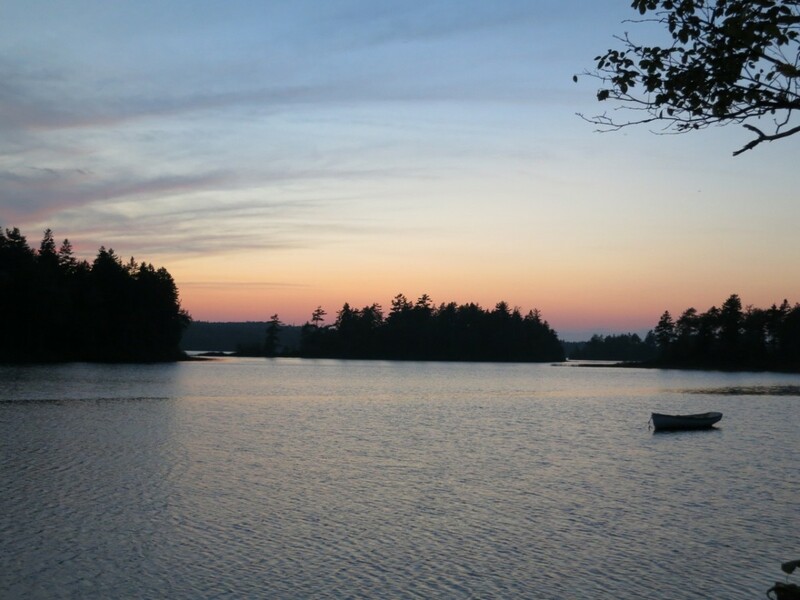 I had a relaxed sort of working vacation, visiting my friend Cyril Reade at his cottage about 35 minutes outside the city. 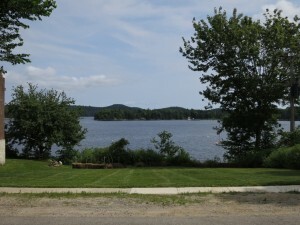 It’s in a small village on a good-sized lake with a nice beach. 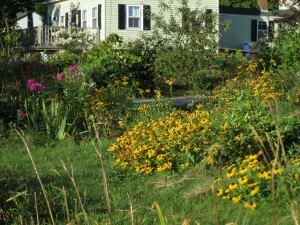 We both had things to do; Cyril had projects around the cottage, plus work for Rutgers. 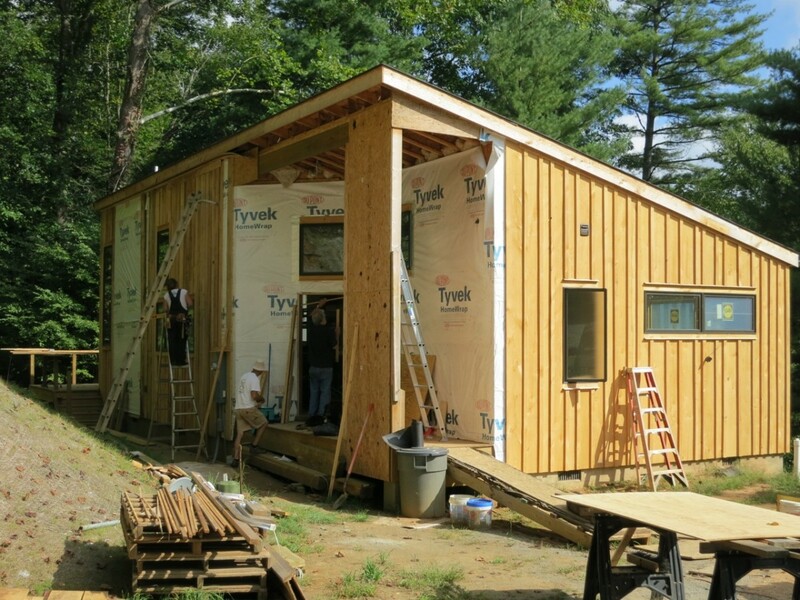 I finished a dozen of my continuing education units in order to renew my Wisconsin architectural license, and wrote a rather involved Fulbright reference letter for a colleague and friend from Evergreen. We still managed to get to the lake in the late afternoons when the sun was less fierce and the Quebecois had gone back to their cottages for cocktails. We also spent some time in Quebec City, did a little shopping, visited the Jade Museum (many spectacular ancient Chinese pieces, plus contemporary work from Canada and elsewhere), and rode the ferry across the St. Lawrence to Levis and back, just for the views. 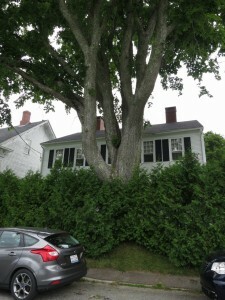 Monday, July 28: We drove down to Orland, Maine, where we stayed with my old friend Barbara Haring, who runs Orland Pottery. We met 35 years ago at Penland! Haven’t actually seen each other for over 20 years, so it’s been great to reconnect in person. 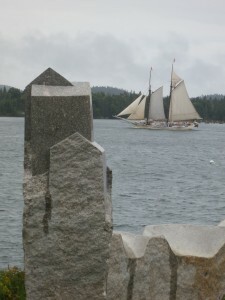 Tuesday, July 29: We drove to Castine, about 10 miles away, where my work will go. It’s a well-heeled small town, with lots of folks from “away” who have summered there for years, and a lot of locals, all of whom are very proud of the place, its sites, its character, and its history. 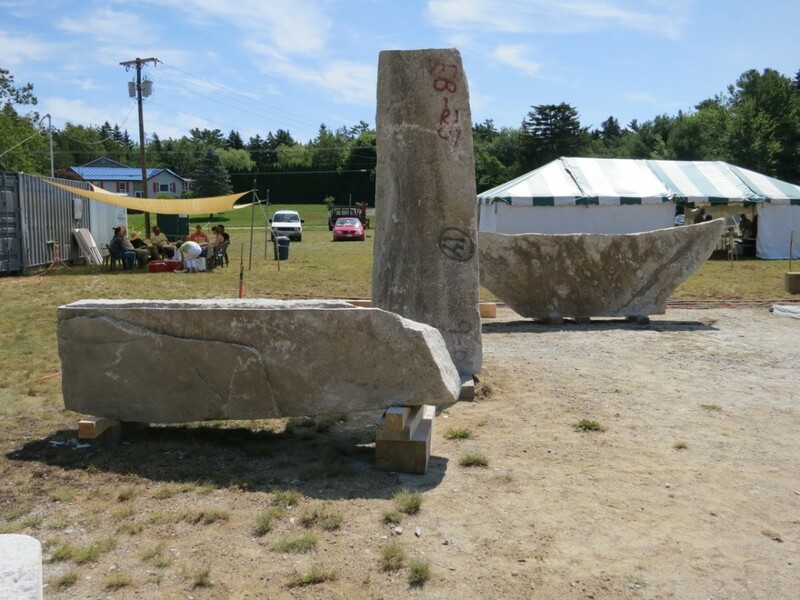 I met Debbie Neve, the sculpture committee chair, who was instrumental in getting Castine involved in the Symposium, and in raising money for the project. 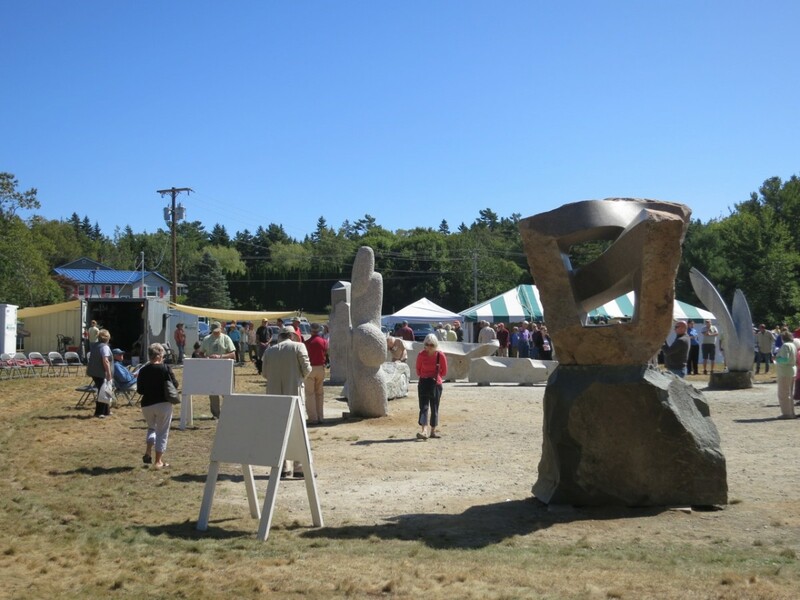 Each of the seven artists is matched with a different town, and each town raises a third of the cost for their sculpture, beyond the $250,000 raised by the Symposium organizers. I had no real idea how much community engagement there was up and down the Maine coast for this event – it’s a big deal! There were over 8,000 visitors last year. I’m feeling pretty fortunate to be a part of it all. Debbie gave me an extensive tour of the town. 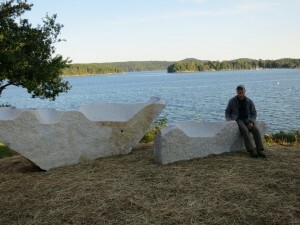 Later I met Jesse Salisbury, a sculptor and coordinator of the Symposium, at the site, with a local contractor who will probably do the installation. 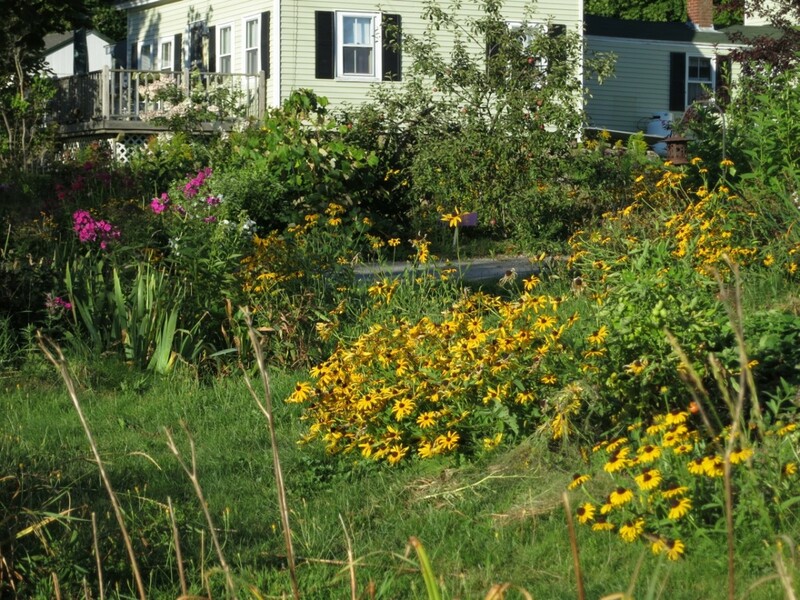 The site is right next to the Wilson Museum, which covers the natural and cultural history of the area, and has a growing program. It’s a challenging site that slopes from the street down to an embankment above the water, with the museum on one side and trees and a large transformer pole on the other. 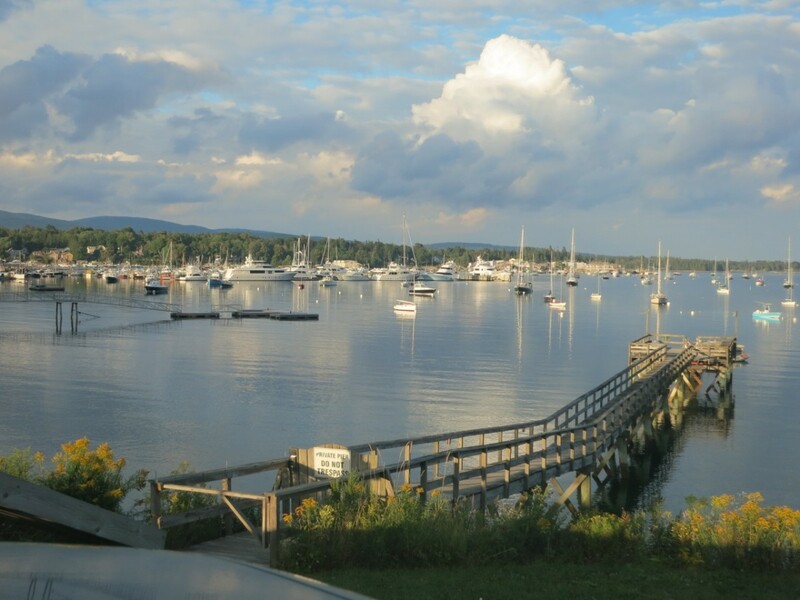 Tuesday night there was a dinner at The Manor, a restaurant that used to be the home of the Commodore of the New York City Yacht Club. I made a short presentation about my work, with pictures, before dinner and fielded questions. It was a nice evening. 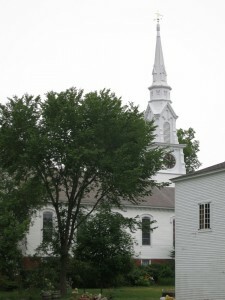 Old churches and giant old elms! Wednesday, July 30: A kayak excursion to see the site from the water, plus a picnic lunch on Holbrooke Island across the Bagaduce River (more of a bay). Then a break, then another boat ride on one of the boats of the Maine Maritime Academy in Castine, to see more, and meet more people. Thursday, July 31: Visited four different granite quarries with Jesse to see what stone was available. Generally the blocks are already cut. We also stopped by Jesse’s very impressive studio. Friday, August 1: Cyril headed back to Quebec. 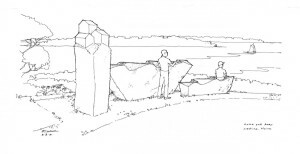 I spent the day documenting and drawing at the site. 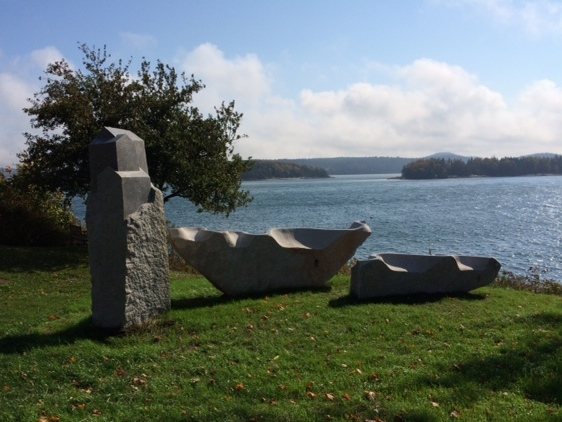 Came up with my general concept that morning – a piece tentatively titled Home and Away – two words I heard a lot in Castine. 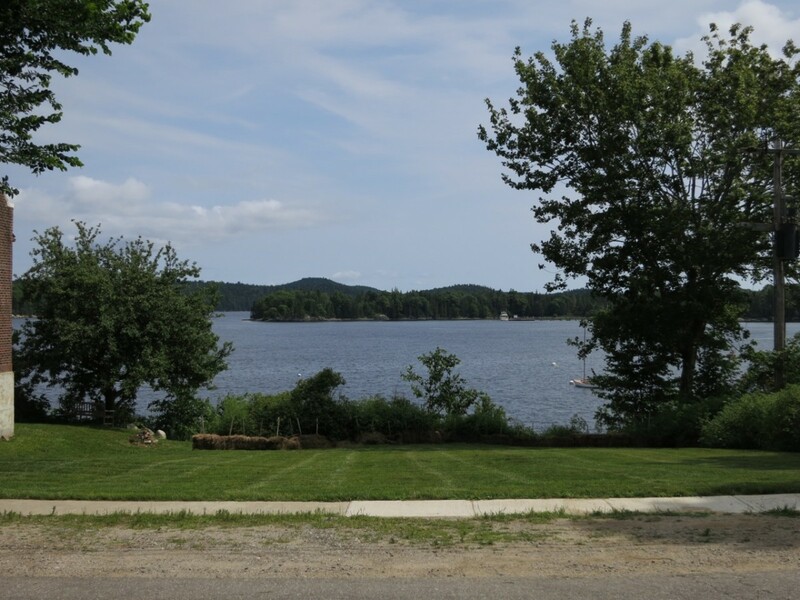 Saturday, August 2: Barbara ferried me to Ellsworth, Maine, where we did a little shopping, and I met Tilan Copson, who assists Jesse in organizing and coordinating the Symposium. She brought me to Winter Harbor, where the sculptors and assistants are all staying in a large old bed and breakfast – a quirky place, but nicely appointed. We have dinners here, and lunches on the field. Breakfasts we do ourselves. The artists all arrived – two young guys from Maine, an older Maine sculptor, a Korean, a Georgian, a woman from Switzerland, and me. An eclectic and interesting bunch, and we’re getting along famously. Sunday, August 3: Jesse and I made a quick trip in the afternoon back to two quarries near Jonesboro, where we looked for stone for two of the others, and finalized my choices. My stone is a grey granite with lavender highlights The Symposium began at 5 PM with an event at the field – lots of people again, and wine and food. Monday, August 4: We went back to the Fish Quarry near Jonesboro to load my stones. I heard some thick Maine accents! I rode back to the site with the trucker. He talked non-stop! I’ve got three stones – about 12 tons total!?! First job was splitting off parts to get toward final shapes, then leveling them, then flattening the bottoms, then pre-drilling them for pins when they go on their foundations. 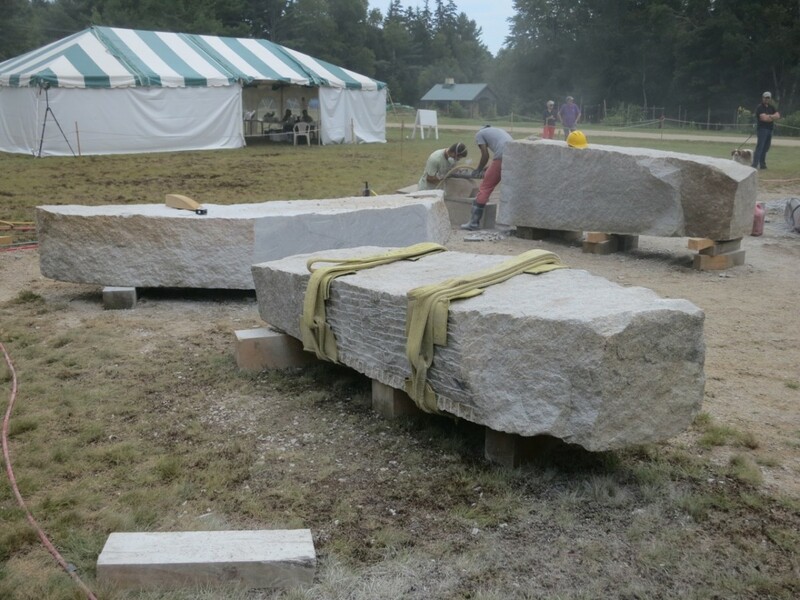 Between drilling and splitting, shifting stones around with a crane, flush cutting (hard side ways, easier horizontally), and a couple thunder storms, that took the rest of the week – for the two big stones. The third stone is almost done. I completely lost track of time and thought Thursday was Wednesday! Thursday, August 7 and Friday, August 8: Stayed up late on Thursday making a drawing of my scheme for another public presentation on Friday night, where the artists were all introduced and there was a short question and answer session. 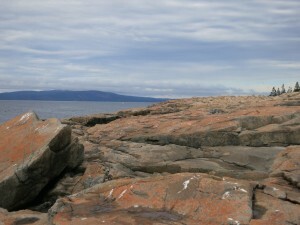 We stopped early that day and I got to take a ride out to the end of the Schoodic Peninsula, part of Acadia National Park. It’s an immense granite headland meeting the Atlantic with sweeping vistas. I met more folks from the area at the presentation, including the State Representative for Castine and his wife. 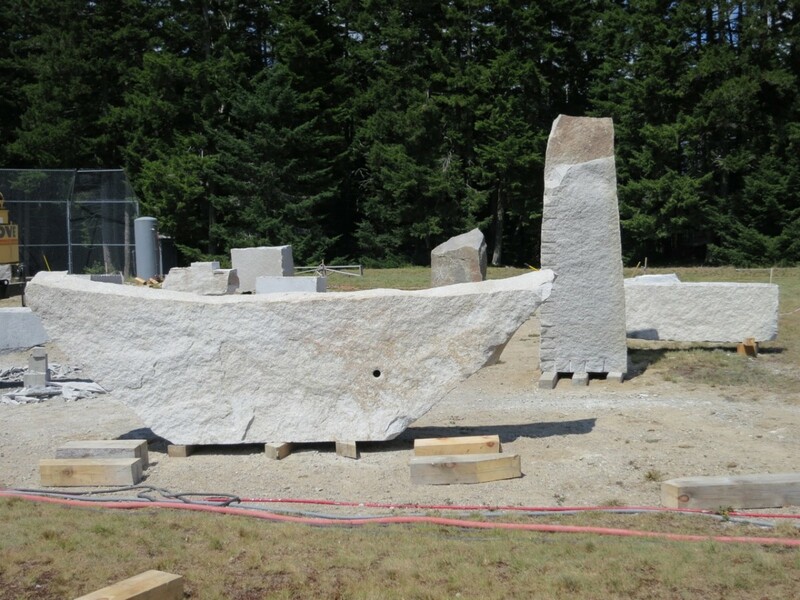 The stone with abstracted house forms is 9 feet high, The 14 foot long stone will have a polished meander on the top that people will want run their hands down, I think. The meander will point toward the open water of the Penobscot Bay estuary leading out to the Atlantic, the polished stone blending with the light on the water (that’s the plan, anyway). 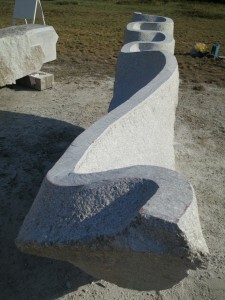 The low stone will also have a meander, but will be low enough to sit on. People like to watch the boat traffic. My plan is to make a tactile and interactive piece for the community. Saturday, August 9: Another work day. I was fixing a grinder and nicked the knuckle of my right index finger – enough to require a couple stitches at the Ellsworth hospital emergency room. 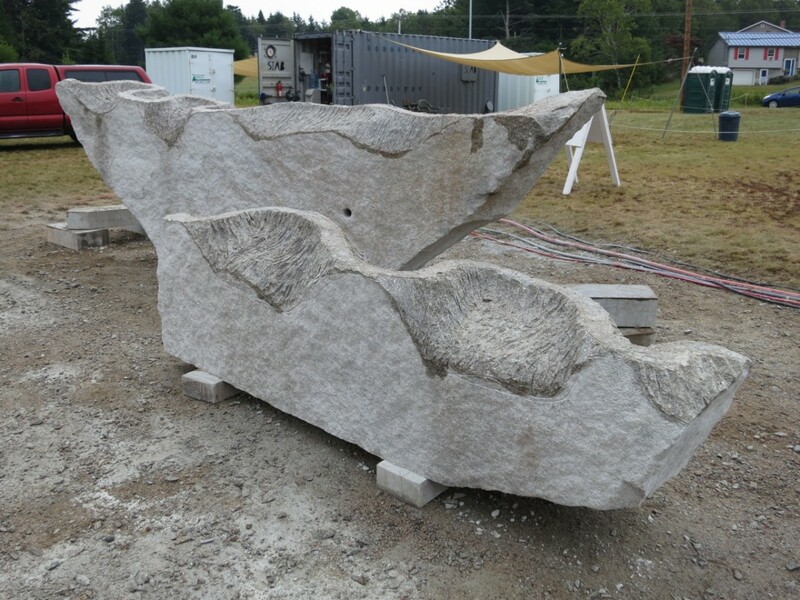 Local stone sculptor Mark Harrington, who’s assisting at the Symposium, gave me a ride, so on the way back, I got to take a look at one of his public pieces and see his studio – the quirky combinations of big wood and stone there were playful and bold. 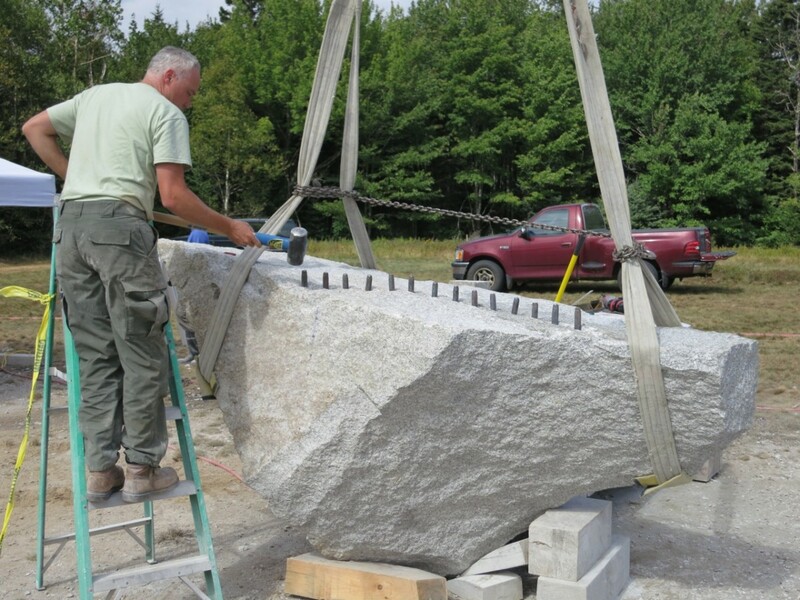 In the afternoon we did a bunch of crane work moving my stones around, and I started flattening the bottom of the third stone. Saturday was the Lobster Fest in Winter Harbor, where we stay – lobster boat races all day, a craft fair (missed all that), and in the evening a street dance in the IGA parking lot just up the street, and a big display of fireworks. I got as close as I could – they always delight me and make me start to laugh – I think of time I’ve watched them with Annie and Valerie in Rochester and Wisconsin. So that’s what I’ve been up to. 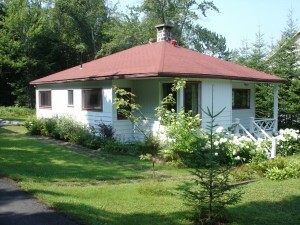 No phone service, but I do have internet, and can borrow a phone or use the phone in the B&B, I think, if need be. There’s plenty to do and learn, and plenty to think about. It’s certainly a different perspective on my routine life. It was great to have time in Castine to get to know the place and let my ideas coalesce, then to see the quarries and consider the stones available, and their potential. When we finally began setting them upright Saturday is was great to see their energy. I feel good about the idea and the stones. 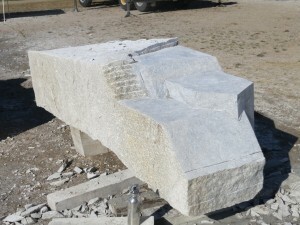 Today, Monday, I flattened the bottom of the third stone, and Randima drilled its pin hole. 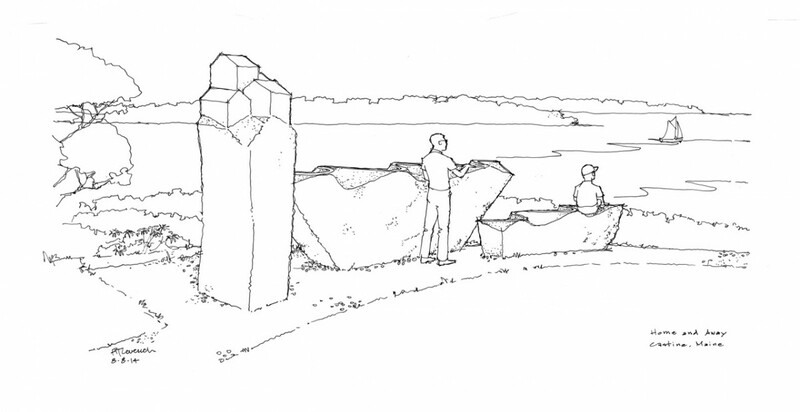 I spent some time drawing the stones in my sketchbook, planning and then on the two big stones, and began cutting the meander on the long stone this afternoon – so it’s well begun. 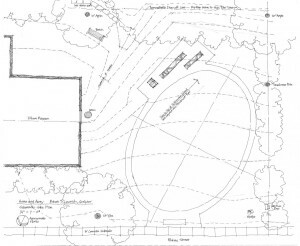 There’s lots to do – I have to draw up foundation plans (they’ll be precast), as well as my proposal for landscaping the site, and on the 20th I’ll be making another public presentation of my work at Hammond Hall here in Winter Harbor. Tonight we went squid fishing – not much luck until most of us were leaving, then one of the other guys caught one. I kept falling asleep over this report; I should aim for shorter ones more often! And now I’ve gotta get to bed – everybody heads to the field between 7 and 8 to get set up and start working. Stone of the Schoodic Peninsula, and Maine blueberries! 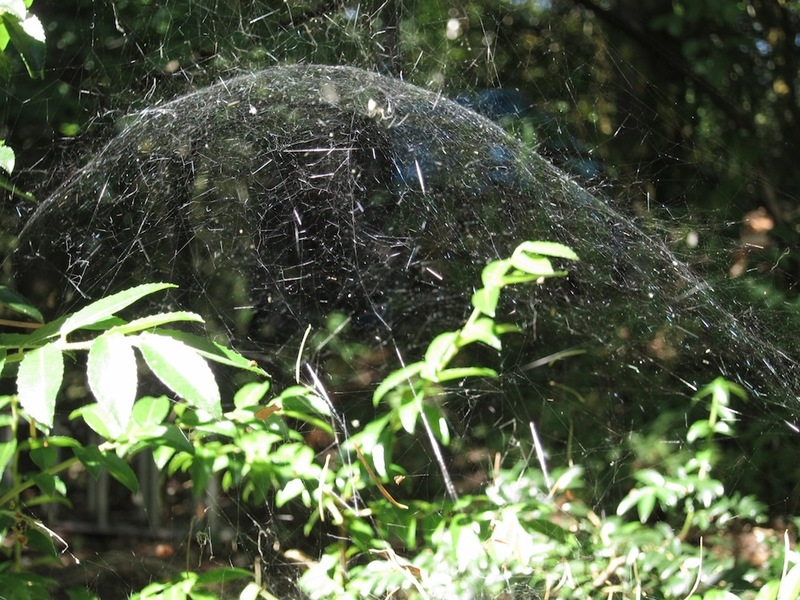 Every year, a spider builds an elegant silk dome in the huckleberry bush beside my steps.